We headed out on this trip on a sunny, windy afternoon. We started off towards the Golden Gate Bridge and continued through the Golden Gate Strait towards Mile Rock. There was a lot of bird activity in the strait. When we made it out to the Pacific Ocean, we made a large circle in hopes of locating a spout. While we were searching, the captain heard a report of whales near Angel Island. Windsurfer underneath the Golden Gate Bridge. We made our way back towards the Bay and headed for Raccoon Straits. There was a lot of traffic in the strait with sailboats, yachts, and small outboard motors. We spotted the first spout close to Angel Island. It was a gray whale with a large white patch near its blowhole. As we waited for the whale to surface again, another whale surfaced near the yacht club in Tiburon. We knew immediately this was a different gray whale because the scar pattern on its body was markedly different from the other one. We watched both whales continue to spout, keeping a safe distance and modeling best practices for all of the other boats in the area. We reported the whales to vessel traffic as well. The whale near Tiburon spouted infrequently. Usually it would spout just once before diving for several minutes. The whale near Angel Island spouted more regularly, taking a few breaths before going down for a deeper dive. The whales seemed to be using the current to stay in the same location for the duration of our trip. Several small boats came very close to the whale. We started off the day with glassy seas and a bit of fog. We headed towards Muir Beach to see if the whales would repeat the same route as the previous day, and on our way out we spotted many active harbor porpoises, harbor seals, and California sea lions in the Golden Gate Strait. But it turned out we didn't need to go all the way to Muir Beach, because there were four humpbacks feeding just off of Point Bonita in only 50 feet of water. The tide line was visible with the different colored bay and ocean water, and some sea foam had formed along the line. We saw several fluke dives, and also noticed a great deal of bird activity right above the whales, suggesting they were pushing the fish up to the surface. I also noted more diving pelicans than usual. On our way in, we spotted another humpback near the Golden Gate Bridge, but didn't stay with it for long. As we set out on our second trip of the day, we heard reports on the radio of whales by Baker Beach and Diablo Cove. We headed out into the strait, but had no spouts in the reported areas. A foamy tide line separates the bay and ocean water. We found one humpback outside of Mile Rock near the Cliff House. The tide line was much more dramatic than on the previous trip, and the ocean side was much more choppy and green with phytoplankton. We also looked at our sonar readings and found that the bay water showed no food, but the ocean side showed anchovies down to about 90 feet. The whale, who had a distinctive rounded fluke, worked this line the entire time. We also spotted 3-4 more spouts on the horizon. On our way back in we saw a California sea lion snapping up a king salmon, with several western gulls lingering above, hoping to steal a bite. These sightings were reported to the Coast Guard and NOAA on the Whale Alert app. Our first trip of the day had beautiful conditions as we headed out to find whales. On our way out, we passed a few pigeon guillemots and common murres with chicks. We first went straight out into the shipping lane, then turned north to search up the Marin coastline. Several sea lions rested on one of the shipping lane buoys as we passed by. After some searching, we spotted one spout near Muir Beach. The spout and the whale were both small; it seemed to be heading north. We saw the fluke once before we needed to head back to port. On our way back in, we received reports that there had been a small whale at the Golden Gate Bridge one hour earlier that had seemed to be heading out, and we hypothesized that it was the same whale that we saw further down the coast. The weather was still nice as we headed out for our next trip. We pushed our speed, thinking we would need to go all the way back to Muir Beach to find the whales again but instead we spotted them right outside of Mile Rock. We had three humpbacks feeding and working the same spot, and saw several flukes. Two of the whales surfaced together and were a potential mother-calf pair. There was a lot of harbor porpoise and bird activity, with large groups of murres, pelicans, and cormorants feeding in the same spot. On our way back to port, we recovered a lifejacket which was floating in the water and brought it back to the pier. On our last trip of the day, the three humpbacks feeding outside of Mile Rock were still there, along with many harbor porpoises and at least one harbor seal. The tide line was extremely frothy with a distinct difference in water color - we could see the bay water on one side, and the ocean water on the other, with a line of sea foam marking the boundary. The sea foam is caused by zooplankton, and often indicates a good feeding spot. Fog creeping in behind Point Bonita. Distinct fluke pattern from one humpback. We thought we recognized this individual from last year. We saw many flukes and spouts. The wind began to pick up and the fog started to set in as we headed back to port. Breach! Photo by passenger Jenete Klein. We headed out into the bay with a little bit of wind, and our port side got some spray as we moved towards the bridge. Once past the bridge we spotted spouts and large splashes by Mile Rock and slowly made our way there. From 500 yards away we saw a humpback breach. We proceeded with caution, only to see another breach when 200 yards away. We put the boat in neutral and floated over the tide line. The line was a dramatic divide between the choppy green bay water and the calmer, dark gray ocean water; once we passed over the line, it was much more comfortable! The two types of water don't mix very much because of differences in salinity (and therefore density). We waited a few minutes before seeing another breach. This one was close enough to see that the whale was quite small. After the breach, the humpback slapped the water with its pectoral fins for a few seconds. We saw this whale do the same behaviors again and again: a breach followed by 30-60 seconds of fin slapping. Once and a while a larger whale would surface nearby, often very close to the smaller whale. I suspect they were a mother and calf. We saw the mother's fluke a few times, but she was much less active than the calf. A pectoral fin poised to slap, with the Golden Gate Bridge in the Background. Photo by passenger Jenete Klein. We had 3 humpbacks by Mile Rock, and noticed more spouts on the horizon. We started to slowly head back to the pier. But on our way back in, a different humpback breached 200 yards from our starboard side! This humpback also seemed small and was also with a larger, calmer adult. This calf breached 3-4 times and did a few quick pectoral fin slaps. 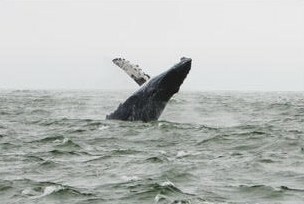 The other calf could still be seen breaching on the horizon near Mile Rock. Humpback fluke. Photo by passenger Jenete Klein. The total count for this trip was five humpbacks within 300 yards of the Kitty Kat, with 2-3 more spouts sighted within 1000 yards. We also saw harbor porpoise, California sea lions, and common murres with their chicks. When we left the dock for our last trip of the day, the wind and the fog had both picked up. We had a spout just a few hundred yards outside the bridge near Baker Beach, and we sat and watched that humpback for a few minutes as it headed east towards the south tower of the bridge. I saw more spouts out near Mile Rock, so we headed out there. We found three humpbacks in between Mile Rock and Point Bonita, all exhibiting feeding behaviors. Each of the three had a cloud of birds swarming around it every time it surfaced, making it easy to pinpoint where they would pop up next. We floated in neutral 200 yards away, and none of those whales chose to approach us. There was a lot of bird activity on this trip, including Caspian terns, pelicans, cormorants, gulls, common murres with chicks, as well as a pigeon guillemot. We also spotted a juvenile black crowned night heron hanging out on the dock as we were leaving for the day. Juvenile black-crowned night heron at Pier 39. Photo by Jennifer Hendershott.